With a new term starting next week, we bring you some highlights for the start of 2013. A definite musical highlight of the term will be Oxford’s new Humanitas Professor, Imogen Cooper, performing Schubert on Saturday 2nd February in St John’s Auditorium. As the Inaugural Humanitas Visiting Professor in Classical Music and Music Education, Ms Cooper will be delivering a series of public events over the next two terms, beginning with this recital for which tickets must be reserved in advance. Later in the month, Britten’s centenary will be celebrated with performances of the complete Canticles by tenor Daniel Norman at the Holywell Music Room from 15th – 16th February, the War Requiem at 20.00 on 9th March in Oxford Town Hall with a pre-concert talk by Lord Patten, and a masterclass on Saturday 23rd February led by Teresa Cahill. The Rite of Spring’s centenary also falls this year, with talks from Dame Monica Mason (Royal Ballet Director, 2002-2012) and Jane Pritchard (Curator of Dance at the Victoria and Albert Museum) on Wednesday 20th February at the Jacqueline du Pré Music Building to mark the occasion. The JdP will also see Steven Isserlis and Connie Shish perform Hahn, Fauré, Adés, Saint-Säens and Franck on Saturday 16th February for Isserlis’s annual concert as part of the JdP Concert series. On Friday 25th January at the Ashmolean Museum, David Todd will conduct John Eccles’s opera The Judgement of Paris as part of the Museum’s Late Night Friday ‘An Evening with the Gods’. It will be only the second time the opera has been staged in Oxford since its performance in the 1960s at the Holywell Music Room. At the opposite end of the spectrum of combined music and drama, A Theory of Justice: The Musical! will run at the Keble O’Reilly Theatre from Wednesday 30th January – Saturday 2nd February. This is the world’s first feature-length musical about political philosophy, and ticket holders also gain access to pre-show lecture and an opening night post-show panel discussion with the writers and directors. For experimental music, the M@SH Marathon 2013 (Saturday 26th January, 7pm, Jacqueline du Pre Music Building) features improvisations, performances by OxLork, the Oxford Gamelan, and the premiere of a new electroacoustic work by Trevor Wishart. Also look out for An Evening of John Cage at the Port Mahon on Saturday 12th January, featuring performers from King of Cats, Fixers, and Red Square. For more C20th repertoire, Oxford University Sinfonietta will be performing Octandre by Varèse, Ravel’s Le Tombeau de Couperin and Poulenc’s Sinfonietta alongside Rameau on Tuesday 5th March in St Peter’s College Chapel following their remarkably successful performance of, amongst others, Ligeti and Pärt last December. traditions, will be hosted by Oxford Contemporary Music on Thursday 7th February at St John the Evangelist Church as part of the group’s UK tour, which also includes a performance at the Southbank Centre. A cappella group Out of the Blue will be performing at the New Theatre alongside comedians such as Michael McIntyre at a charity concert for Helen & Douglas House. This term also sees Christ Church’s Festival Week (18th – 24th February), with performances by Oxford University String Ensemble, Oxford Collision Ensemble, and Christ Church College Choir, alongside the Turl Street Arts Festival with plays, poetry, art and music running from 8th – 17th February. Contemporary Aboriginal artist Christian Thompson’s exhibition of photographic self-portraits and video installation, ‘We Bury Our Own’, runs at the Pitt Rivers Museum until Wednesday 17th February. Thompson says of the exhibition that it was ‘inspired by and in dialogue with the Australian photographic collection at the Pitt Rivers Museum… I wanted to generate an aura around this series, a meditative space that was focused on freeing oneself of hurt, employing crystals and other votive objects that emit frequencies that can heal, ward off negative energies, psychic attack, geopathic stress and electro magnetic fields, and, importantly, transmit ideas… Perhaps this is what art is able to do, perform a ‘spiritual repatriation’ rather than a physical one, fragment the historical narrative and traverse time and place to establish a new realm in the cosmos, set something free, allow it to embody the past and be intrinsically connected to the present?’ (Quoted from the Pitt Rivers’ website) Other forthcoming exhibitions include Oxford photographer Mark Alger’s outdoor and landscape photography in The Gallery Corridor (Museum of Oxford) from Thursday 3rd – Wednesday 30th January, Armorel Clinton’s work at the Jam Factory from 7th January – 4th March, and Patricia O’Brien’s ‘Chasing Beauty‘ at Jericho Art from 14th February – 16th March. The Kino Club at Modern Art Oxford presents a screening of Ai Weiwei: Disturbing the Peace followed by a discussion with Dr Katie Hill on Thursday 1st February. The documentary, shot on a hand-held camera, follows Weiwei’s encounter with the Chinese justice system as he attempted to attend the trial of Chinese activist Tan Zuoren. A documentary exploring Fairytale by Ai Weiwei will also be shown on January 25th. The Old Fire Station’s Theatre Scratch Night returns on Tuesday 15th January, giving Oxfordshire artists the opportunity to perform, be it script extracts or improvised theatre. Rough-Hewn Theatre, an Oxford-based theatre company dedicated to producing contemporary plays and retellings of classics, present Antigone after Sophocles. This is a modern retelling of Antigone, set in the London riots, running at the Keble O’Reilly Theatre from 20th-23rd February. Three events at the Oxford Playhouse look set to become highlights of the theatrical calendar, starting with Angels in America (23rd – 26th January). Written by Tony Kushner and winner of both the Pulitzer and Tony Awards at its premiere, the play is set in 1980s America amidst the AIDS pandemic. This is followed by a student production of Julian Mitchell’s award-winning Another Country (13th – 16th February), while 11th March sees the dance show Freedom, directed by the award-winning choreographer and associate artist of Sadler’s Wells, Jasmin Vardimon. Meanwhile the Actors Touring Company bring contemporary Russian playwright Ivan Viripaev’s english language debut, Illusions, an exploration of the nature of true love, to Oxford at the North Wall Arts Centre on Friday 15th February. Following their exceptional programme of events last term including a reading by Karl Kirchwey, the Oxford Poetry Society will this term be hosting Sir Andrew Motion, Poet Laureate (1999-2009) and founder of the Poetry Archive, speaking at St Anne’s College on Thursday 24th January. For budding poets, the Museum of the History of Science will be holding a poetry workshop with poet-in-residence Lesley Saunders on Tuesday 12th March, aimed at writing science-inspired poetry. 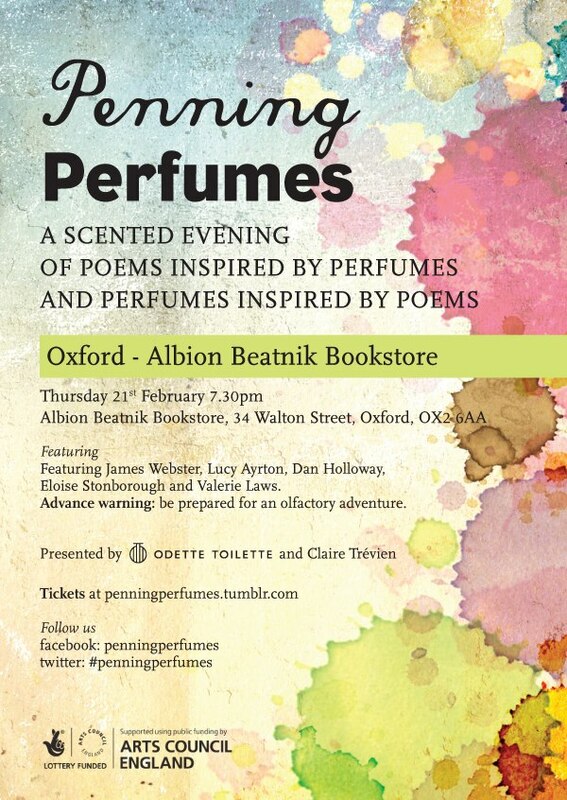 The Albion Beatnik bookstore in Jericho also host regular poetry readings and other literary events, a highlight of which promises to be ‘Penning Perfumes’ on Thursday 21st February, an evening of poems inspired by perfumes, and vice versa.